Adapted from a recent press release: Airship Operations has announced the execution of a US$6.4 million contract for a Skyship 600 B airship to be provided to CargoLifter. The contract includes a training package designed to help CargoLifter achieve German approvals for the operation of airships. The Skyship 600B will be used to help CargoLifter to prepare for its future operations. As part of the sales agreement, Airship Operations will build the Skyship at a hangar facility in Cardington, England. Construction will start in early March, with the test flight expected over Cardington in late April. The training program will begin after the completion of test flights in the U.K. The ship will depart England and cross the English Channel for its new home base in Brand, Germany, where CargoLifter is building the world's largest hangar facility. Additionally, where the training program permits, the Skyship 600B will be used for more traditional airship activities, such as corporate flights, aerial camera work and scientific research. The Skyship will be registered as N600CL. For additional information about CargoLifter, please visit the CargoLifter web site. For additional information about Airship Operations, please see the Airship Operations web site. If you were attending the Spring Internet World Exhibition in Los Angeles last week, you might have noticed an oddly familiar "face" overhead. It seems that the Hilfiger Blimp, a Skyship 600B registered N610SK and operated by Airship Operations has been repainted to become the "Colleges.com" blimp. This goes to show how dynamic the blimp advertising business really is becoming. 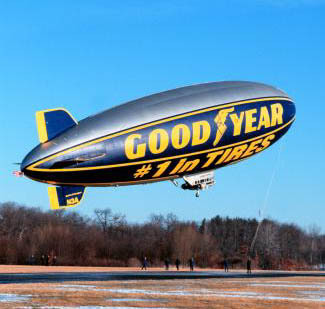 Besides the few companies like Goodyear, Fuji and Met Life which have made long term commitments to an extensive blimp advertising program, short term promotional efforts are becoming the norm. I just hope that the strong push for airship advertising by American "dot.com" companies survives the bursting of the economic bubble which will come sooner or later. 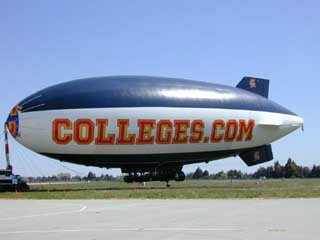 Please visit colleges.com for more information about the new "Colleges.com" Blimp. A recent article in the New York Post, Blimp Port Proposed for Flushing, describes plans for a blimp port near New York City. According to the article, Flushing resident and airship enthusiast Alan Gross is petitioning authorities to transform abandoned Flushing airport into a permanent blimp landing site. (Flushing is the town just outside of New York City which hosts the annual U.S. Open tennis tournament.) You can already get scenic boat and helicopter rides around New York, but blimp rides over the spectacular Manhattan skyline would beat it all. There is a new addition to the European RC airship marketplace. Based in Lausanne, Switzerland, MiniZepp started manufacturing and selling a range of high performance indoor RC advertising airships in the second half of 1999. 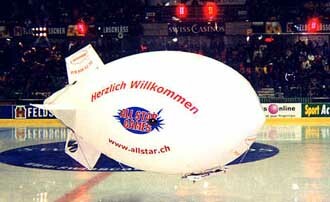 So far, MiniZepp has managed to sell several RC blimps to ice hockey and basketball clubs in Switerland. MiniZepp sets itself apart from the competition in two major points: 1. Price and 2. Support. In addition to offering the most competitive prices, MiniZepp will deliver a blimp to your door and train a pilot for at no additional cost to the customer. It seems that this would be a very promising business model. For more information about the MiniZepp range of RC advertising airships, please visit the MiniZepp web site. If you live in an appartment that is too small to play host to a full-fledged RC airship, have a look at Piranha Airships. Piranha's 2.5 foot long blimps are fast and agile. They are probably also the smallest functional blimps ever made and are powered by a rubber band attached to a 7 inch propeller. 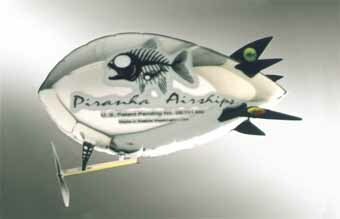 For further information or to buy on of these little wonderblimps, please visit the Piranha Airships web site. First American Woman in Space Christens New "Spirit of Goodyear"
On Wednesday, the "Spirit of Goodyear" was christened by Sally Ride, the first American woman in space, and then made its maiden flight from Goodyear's Wingfoot Lake airship base near Akron, Ohio. This GZ-20 will replace the GZ-22 Spirit of Akron which deflated in late October last year. If you ever visit the Wingfoot Lake hangar, you will understand why the new ship is of the older GZ-20 design. The hangar workshop contains enough GZ-20 spare parts to build several ships. This choice will streamline Goodyear's US blimp operation by standardizing on the less sophisticated but presumably more reliable GZ-20 type. For more information, please see two articles (first and second) in the Akron Beacon Journal or visit the official Goodyear Blimp web site. Five years ago this month, in March 1995, I started a small project. Named "Available Airship Resources" my collection of links went online on the day after I learned how to surf the web and write HTML. I realized quickly that virtually no information about airship technology was available online. I compiled data, pictures and other documents and published them on my homepage at Amherst College. What started as a collection of links is today the most extensive online reference on airships. The two leading airship sites at the time (Mark Zimmerman's now defunct "All About Blimps" and John Dziadecki's still available "Airship") provided the initial inspiration. After that, contacts and friends on and off the Internet provided the information which makes up the Airship Resources today. My passion for airships provided the hundreds of hours required for research and to develop and maintain this site. With your help and support, I am looking forward to improving the Airship Resources for many years to come. I hope you like the new look of the Airship Resources, including the hand drawn "5 Years" logo. Please excuse any broken links and formatting errors as I update the whole site. This summer, the Airship Association will hold its Third Biennial Airship Convention and Exhibition on 1-5 July, 2000 in Friedrichshafen, Germany. The four most imporant airship companies, American Blimp Corporation from the United States, Airship Technologies Ltd. from England and Zeppelin Luftschifftechnik GmbH and CargoLifter AG from Germany will all be present. Bar a major disaster, I will be attending the Airship Convention for all five days. If you have an airship-related product, service or idea that you would like to discuss with me or even if you simply want to get together for a chat and drinks, please drop me a line. Last Friday, a Television Report on Channel 2000, a CBS affiliate in Southern California, reported that two persons had died while working on a Worldwide Aeros blimp. The 48 meter (145 ft) long Aeros blimp is under construction for Airship USA, an airship operating company based in Las Vegas. According to the report, the two workers were found dead by the pilot of the airship and are believed to have been asphyxiated by the helium inside the envelope. Since "they cut it open" to free the two workers, a man and a woman, they were presumably inside the envelope. Even though it is stated that no "foul play" was suspected, the safety precautions (not) taken were foul at the very least. It provides some food for thought that the first two airship related deaths in several years are due to the inert and thus "safe" Helium. Airborne Grafix is a German company based in Langenargen which specializes in the graphical decoration of airplanes and airships. As a matter of course, they like to illustrate their graphical proposals before translating them to the scale of an airship and applying them to the envelope. Their well designed web site takes you on a guided tour of historical, recent and proposed airship designs from Goodyear's Pilgrim of 1925 to the recent re-application of a blue stripe to replace the "Stuttgarter Hofbräu" advertisement on the Zeppelin NT-07 prototype. There are even a few design proposals for the first serial NT-07 which will be delivered to Skyship Cruise Ltd., a Swiss company formed for the operation of the new Zeppelin airship. If you have an airship to paint in the US, you may want to contact Burt Dodge, with 17 Airships probably the most prolific airship artist. But if you have an airship that needs graphical enhancement in Europe, Airborne Grafix will serve you best. As some of you may have noted, I accidentally uploaded incomplete versions of the Thermal Airship Directory and of the Helium Airship Directory a few days ago. Most airship images, in particular the thumbnails, are missing. I hope to have images up in the next few weeks. In the meantime, the textual information has already been revised and contains quite a bit of new information. Please have a look despite the lack of visual material and let me know what you think of the new format. 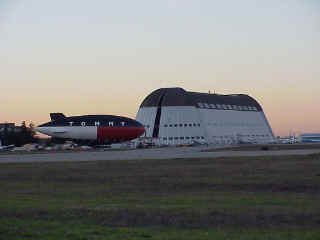 This past December, the Hilfiger Blimp visited the historical airship hangar at Moffett Federal Airfield in California. (I erroneously named Lakehurst before being made aware of the mistake.) The Skyship 600B, which is owned and operated by Airship Operations, received its annual inspection during its two week stay at this historic site which supported U.S. Navy blimp operations during World War II. In addition to cleaning the 200 ft long envelope, some of the 8,200 light bulbs on the night display sign were replaced. For more information about the Hilfiger Blimp's visit to Lakehurst, please see the Airship Operations press release. For information about the Skyship Series airships, please visite the Global Skyship Industries web site. For more information on leasing an airship for advertising or other missions, have a look at the Airship Operations web site. I hope that all of you enjoyed fun and comfortable New Year's celebrations with family and friends, without much Y2K computer trouble. If you have not already done so, please change your links and bookmarks to www.myairship.com. Going into this new century, let us do all we can to bring airships back to everyday applications. Airships are destined to a bright future in the 21st century. According to a recent press release, the blimp which will replace the Spirit of Akron, which deflated at the end of October last year, will be named Spirit of Goodyear and will be ready to fly at the end of February. A second release indicates that Gooyear blimps were involved in telecasts for New Year's celebrations in Sydney, Australia; Rome, Italy; Barcelona, Spain; London, England; Rio de Janeiro, Brazil; Miami, Florida; and Los Angeles, California.